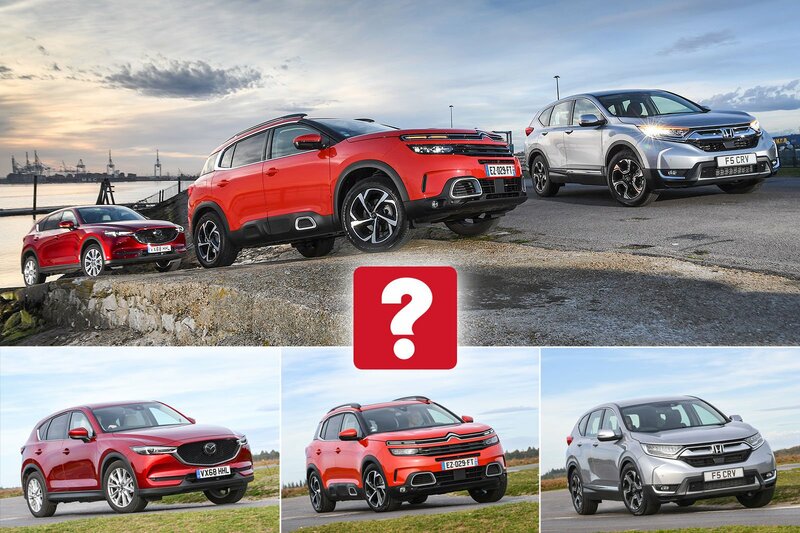 New Citroën C5 Aircross & Honda CR-V vs Mazda CX-5 | What Car? Bold-looking, all-new C5 is based on our favourite large SUV, the Peugeot 5008. No diesel option for new CR-V, which also promises improved space and interior quality. One of our favourite large SUVs, with agile handling and a classy, lavishly equipped interior. We get lots of letters along that line, and they’re understandable; older diesel engines do spew out all sorts of muck and quite rightly deserve a drubbing. But although new ones are actually surprisingly clean, the ‘all diesel is bad’ press has meant some buyers just won’t ever pick up a black pump again. So, which is the best petrol option if you want a large SUV? 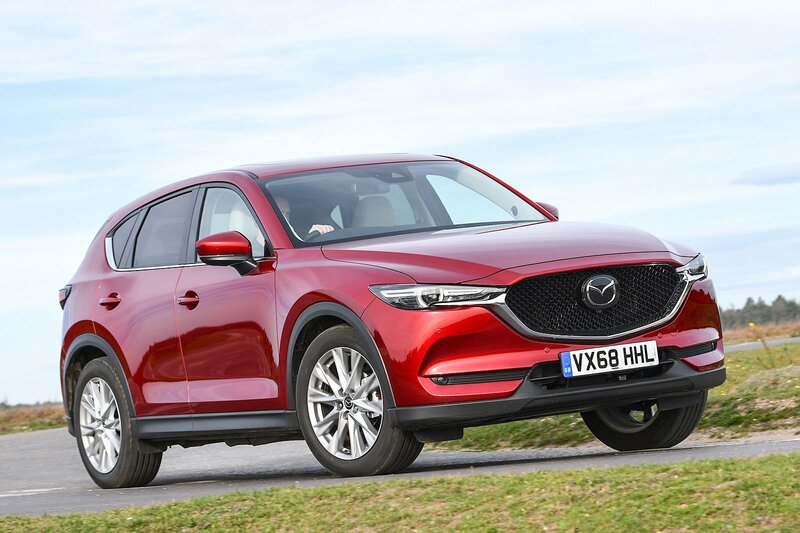 To find out, we’ve lined up three examples, including one of our favourites, the Mazda CX-5. It has a relatively big 2.0-litre engine, but it does without a turbocharger, which is unusual these days. It’s a fine all-round package and comes packed with gizmos in high-spec Sport Nav+ trim. What’s more, this one has the optional six-speed automatic gearbox, yet its list price still looks competitive. Or at least it did until the first of our two new contenders came to be. 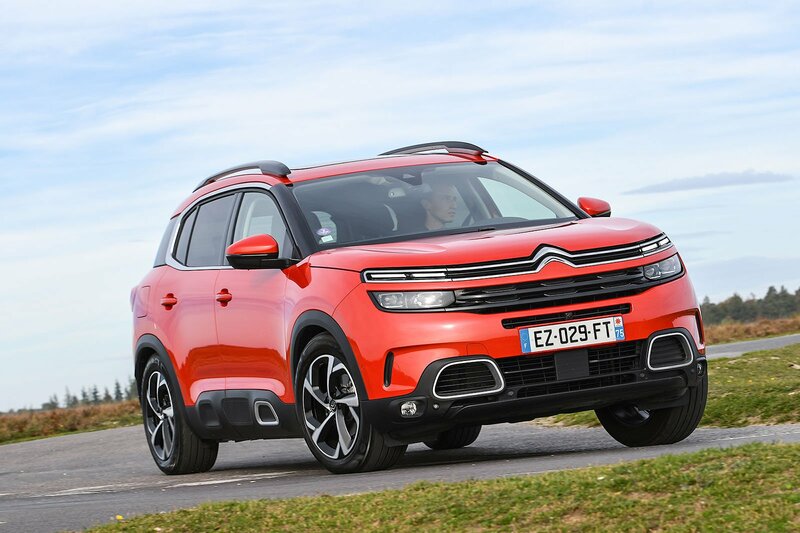 The C5 Aircross is Citroën’s first foray into the large SUV class since the demise of the C-Crosser in 2012, and it undercuts the CX-5 on price in well-equipped mid-range Flair trim. It has plenty in common with our 2019 Large SUV of the Year, the Peugeot 5008, but contains five seats, rather than seven. We’re testing it in turbocharged 1.6-litre petrol form, which comes exclusively with an eight-speed automatic gearbox. Our other debutant is the new, fifth-generation Honda CR-V, which is bigger and plusher than its predecessors, as well as the first to offer seven seats – although here we’re testing the cheaper five-seater. It may be the priciest of the three to buy, but it could have been made for this test, because Honda has dropped diesel from the range altogether. A hybrid has taken its place, and we’ll evaluate that in due course, but for now we’re focusing on the 1.5-litre turbo petrol version. It’s paired to an optional CVT gearbox, which by default adds four-wheel drive. You can also have this on the CX-5 if you need the extra traction, but the C5 is exclusively a front-driver. Hearing about the benefit of something is quite different from feeling it in action. And if you want to experience the advantage of turbocharging, driving the C5 and CR-V back to back with the CX-5 demonstrates it perfectly. When you want to put your foot down and feel the car respond accordingly, the former pair are far more forceful in the lower two-thirds of the rev range. This is down to the CX-5’s dearth of torque; by having more of the stuff, the other two, particularly the C5, are more relaxing and effortless to drive. To get the best out of the CX-5, you need to rev it like it’s a two-stroke strimmer, but even then it’s found wanting. It also lags behind when you accelerate through the gears – and by some margin. Try to overtake on a country road and you’ll need a much bigger gap than you will with its rivals. In fact, the C5 and CR-V are so synchronised from 0-62mph and 30-70mph that it’s hard to believe they don’t come from the same factory. So, the CX-5 requires a heavier right foot, which reveals another problem: it sounds rather shrill when revved. This isn’t helped by its gearbox, which chases lower gears too eagerly and then seems reluctant to change up again, even some seconds after you’ve settled at your chosen cruising speed. We rarely have a good word to say about CVT gearboxes, because when you need a bit of power, even just to get you up a slight incline, they tend to send the engine racing. But unless you bury the accelerator pedal deep into the carpet, the CR-V’s CVT keeps things relatively restrained, to the point that it actually does a better job than the CX-5’s gearbox. And while the CR-V’s engine is no quieter than the CX-5’s (actually, it’s a touch noisier around town), it sings a sweeter note, so it bothers you less. Comparatively, you might think the C5’s engine has been wrapped in cotton; it’s noticeably quieter, even when you work it hard. Yes, you can feel vibrations when you rev it hard between 5000 and 6000rpm, but its rivals aren’t infallible in this respect, either. The C5’s gearbox also rises above its competitors, being the most responsive off the line and nearly always dropping to the right gear quickly. The downside is that if you back off hastily, you sometimes catch it off guard and make it clunk, or even jolt, especially when the car is cold. For a spot of peace and quiet on the motorway, the C5 is absolutely the best seat in the house. It’s remarkably tranquil, with just a soft flutter of wind noise and some background road roar to indicate your speed. Swap to either other car and things get noisier, mostly due to squalling wind noise in the CX-5 and a combination of wind and road roar in the CR-V.
And ride comfort? Well, there are stark differences here between the C5 and CX-5, with the CR-V slotting somewhere in the middle. Mazda has set up the CX-5 to feel sporty, and its ride suffers as a result. It’s lumpy around town and picks up on small imperfections on the motorway, sometimes making it quite unsettled. Citroën, by contrast, has focused primarily on comfort. Sitting in the C5 at higher speeds is like bobbing tenderly on the saline supportiveness of the Dead Sea. It’s marvellous, unequalled by anything else in this price range; if you like a soft ride, you’ll be smitten. That said, it’s so soft that the gentle rising, falling and swaying motion along a heavily undulating road could make you and your passengers feel slightly nauseous, while around town it becomes lumpy and can be brittle over sharp-edged intrusions. Not as badly as the CX-5, though. Think of the CR-V as the Freddie Flintoff of ride comfort: a fine all-rounder. It doesn’t sway about on uneven surfaces or stumble over sharp intrusions like the C5 and it’s far calmer on motorways than the CX-5. Just don’t expect it to segregate you from the road at speed as distinctly as the C5. The way these cars handle is essentially the opposite of the way they ride. The stiffer CX-5 is the closest to the driver’s choice, with taut body control making it the nimblest through turns. However, steering that is slow and fails to weight up until several degrees of lock are applied is less confidence-inspiring along narrow B-roads. What’s more, when you add a little more lock, the steering becomes heavier all of a sudden – an issue that also blights the CR-V. 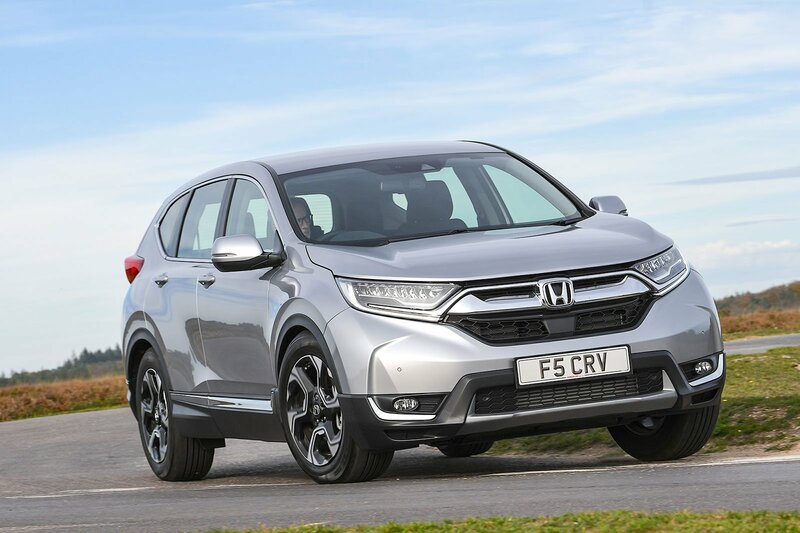 The CR-V has a much more instinctive feel to its steering around the centre, so you can place it most easily on the road, but once its tall body starts to lean over in bends, you conclude quite quickly that it’s no sports SUV. Yet next to the roly-poly C5, it almost could be. It’s really not a good idea to hustle the C5 along a tortuous road, because even by CR-V standards its body roll is alarming, and that’s capped off by somewhat distant and inconsistent steering. There’s enough heft in the helm at higher speeds to match the CR-V’s straight-line stability, though, while around town its light steering (the lightest of the three, in fact) makes it a doddle to park.